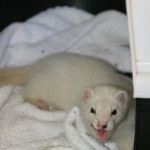 MY SICK ‘LIL FERRET | Beverly's Net: family. food. fashion. MY SICK ‘LIL FERRET – Beverly's Net: family. food. fashion. It’s not your fault, you’re not a vet. The vet should have researched more before recommending that treatment. it was the worst day of my life when i had to let my german shepherd go. so i really pray that star gets well soon. Love, don’t blame yourself, there is no way you could have known. You are looking after Star the best you can. I’m so glad she made it through the night. I hope she continues to improve. *hugs* Hope Star gets better real soon. It’s good that she made it through the night. Don’t blame yourself. It wasn’t your fault. You have done the best you possibly can. Hopefully she gets better soon. Hang in there. Oh dear 🙁 Don’t put the blame on yourself. It’s not your fault! I hope Star feels better soon. poor lil star…..hope she recovers soon and gets back to her hyper self. I hope she gets better soon. And that you feel better too! It’s not your fault! aww.. I hope she gets better soon! I hope you’re coping well too, and taking good care of yourself! I’m glad she made it! That’s scary but hopefully will work out for the best (and by best I mean Star jumping around like crazy again!). i’ll pray for her and you. no honey, its not you’re fault… as pet owners we do the best we can with the info we have… if we had different information we would do thing differently. if we dont, we dont. the best you can do ever is give you’re pet a great wonderful happy life and know that living with you has always been so much better than if someone else took them home… you know? and it has been, hasnt it? my little icon… noodle, is gone now. she was a sweet little girl. and i was in sort of a situation like you I guess.. thinking i would have should have could have… faster. she died of something that she was being treated for… only i wasnt fast enough. she was too weak by the time she was treated.. but how can you ‘go there’ you know? if you could have you would have… you love her, you’ve loved her… you are doing a great job being her ferret nurse… give yourself a break 🙂 just love and care for her and be kinder to yourself. your doing a wonderful job caring for her… if she makes it it will be because she was so well cared for by you her entire life… and if she doesnt there was clearly nothing else you could do. That’s hon, that’s really nice of you..
You wouldn’t believe, my budgie has gastritis too! He can barely breath!!!! When he flies, he falls over and has a fit trying to catch his breath. This also really saddens me a lot, but he is at least eating and drinking, I have to force medicate him orally every couple of hours too! oh nooo poor lil baby! gosh i hate force feeding em….. I don’t think you should blame yourself for this…you did what you thought was right based on the information you had. I’m sure she’ll be fine…especially since she has such a caring owner looking after her. hope she gets better. My little Gwen wasn’t so lucky. she was 7, and apparently she had cancer, so when i took her to the vet, they said that the best thing for her was to put her down. Imagine walking to the vet with a pet carrier and then leaving with an empty one. I send Star good thoughts, and know she’ll pull through cause she’s young ferret. Oh no, I hope she gets better soon!! awww.. poor little munchkins.. I hope she gets well.. Your post is getting worse about her! !